As I mentioned in my post where I detailed out the contents of my daypack, I’m not your typical Gearhead. I like going light (who doesn’t? ), but I wouldn’t consider myself ultralight. Comfort and functionality are very important to me, but I can’t afford to dump a paycheck into a new piece of gear. I like the balance between quality and affordability. With those parameters in mind, my favorite gear purchase of the year was an EMS Drool Pillow. 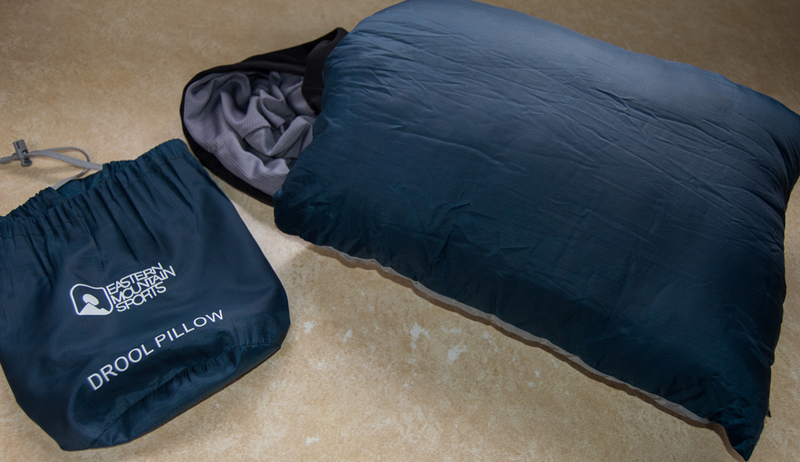 This pillow weighs 8oz, so an ultralight might not consider carrying it, but for me it is worth its weight. Before purchasing this pillow I would use the dry sack holding my clothes as a pillow. While this technically worked, it was not much better than sleeping on my arm or a medium-sized rock. Once I started carrying this pillow with me on overnight trips I began getting more hours of sleep, which provided the necessary boost to carry the extra weight on my back. The pillow comes with a stuff sack which allows it to be packed down to a much smaller size, this is as important as weight to me. My favorite feature with this pillow is the pocket on the back side of the pillow, into which clothing can be stuffed in order to increase the pillow’s size while keeping the loft against my head. For the budget-minded, this pillow goes from good to great. When I purchased the pillow in the spring it cost a little over $6. I now see it online for $12, but that is still pretty inexpensive. If you find it difficult to sleep on the ground and have already tried a few different pads, I’d suggest trying out this pillow or another like it. It definitely made a difference in my multi-day hiking trips. “EMS Drool Pillow.” ems.com. Eastern Mountain Sports, Inc. Web. 23 December 2014. This entry was posted in Gear and tagged Affordable, camping, gear. Bookmark the permalink.